A brand new Surface Go could be yours! 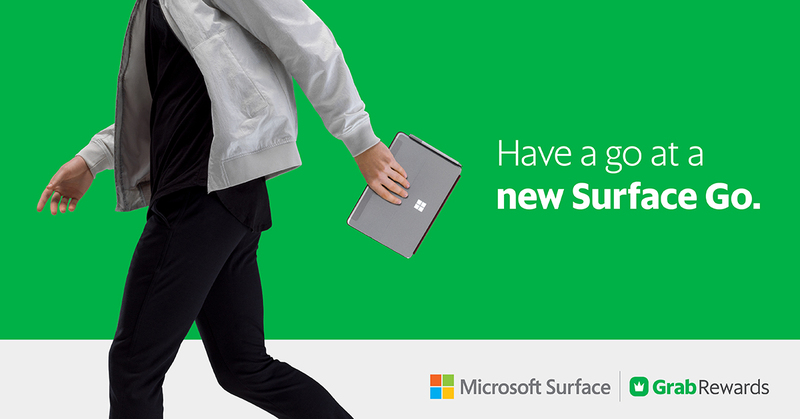 Redeem GrabRewards to win a Microsoft Surface Go. Ready to use your GrabRewards points for a worthy reward? Here’s a chance to win a Surface Go, the new 10-inch device with laptop performance and tablet portability for your everyday work and play. We’re giving away Surface Go with Surface Go Type Cover, Surface Pen and Surface Mobile Mouse worth over MYR 2748. Interested? Just use your GrabRewards to redeem a chance to win the prize for 20 GrabRewawrds Points. The 100th, 1000th, 5000th and 8000th redeemer is the winner during the campaign period. All participants get 1 chance with every 20-points reward they purchase. All participants are required to answer a question via a Google Form after the redemption is made in order to be in the running to win the prizes. By participating in this campaign, please note that participant is consenting to Grab announcing the name of the participant and/or releasing a photograph of the participant as the prize-winner in our winner’s announcement. The prize may be forfeited to the next winner if the participant is unable to comply with this condition. The Campaign will run on 14 September to 30 September 2018. The Organiser reserves the sole and absolute right to alter or end the Campaign at any time prior to the expiry of the Campaign Period without giving any prior notice and no compensation in cash or in kind shall be given.